You may order pre-printed versions of our publications two ways, by mail or online. All mail orders must be prepaid. Checks should be made payable to AHS (US dollars only). For the Heartworm Disease in Dogs and Heartworm Disease in Cats brochures, shipping charges are $12.00 for orders less than 1000 brochures and $15.00 for orders of 1000 or more brochures. There is no charge for the Agonizing to Treat Booklets but there are shipping charges detailed below. Searchable PDF files of all Triennial Symposium proceedings dating back to 1974 are now available as free downloads to AHS members. Simply log in to the member section of the website. Printed copies of the AHS Triennial Symposium proceedings from years 1980 to 2013 are still available upon request. Contact us at info@heartwormsociety.org to request a specific proceedings. There is a shipping and handling fee of $10 per copy for mailed copies. Attention getting! 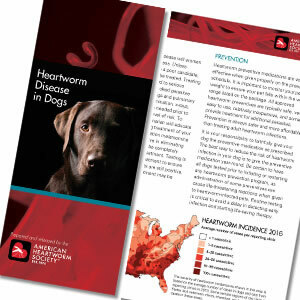 Make it easy to introduce heartworm prevention with our highly appealing, bright red, heart-shaped client brochure. Stock your waiting area, put one in each puppy or kitten packet, and use this simply written, reader-friendly pamphlet to support your discussions with pet owners. 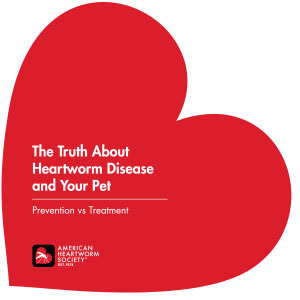 You’re sure to find that “The Truth About Heartworm Disease and Your Pet: Prevention vs Treatment” helps owners understand in few words why preventing heartworm disease makes much more sense than risking the personal anxiety, pet stress, and potential physical damage associated with undergoing a canine treatment regimen. Content also highlights the lack of treatment options for feline patients. Available in quantities of 100 for $36 plus shipping. Heartworm basics for your clients with dogs. An illustrated canine-specific overview of heartworm disease designed to introduce and explain the infection to dog owners, including the heartworm life cycle, signs of the disease, how to detect the infection, which dogs should be tested, incidence of canine heartworm disease in the United States, how to prevent the disease, and the risks associated with treatment. The tone is clear and comfortable for dog owners to read, yet specific enough to provide fundamental knowledge and an emphasis on prevention. This is an excellent take-home piece and can be mailed in letter-sized envelopes as part of your canine heartworm prevention campaigns. Available to AHS members in quantities of 100 for $20 plus shipping (nonmembers $30 plus shipping). Members: login to get member pricing. Heartworm basics for your clients with cats. 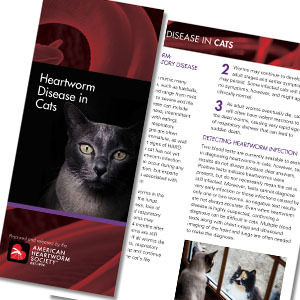 This illustrated species-specific overview of heartworm disease is designed to introduce and explain the infection to cat owners, including the heartworm life cycle, signs of the disease, how to detect the infection, which cats should be tested, incidence of feline heartworm disease in the United States, and how to prevent the disease. Content also emphasizes the fact that no treatment is available for cats and clarifies why. The language is plain and friendly for cat owners to read, yet detailed enough to provide essential knowledge of the disease, carefully stressing the need for prevention. This is an excellent take-home piece that can also be mailed in letter-sized envelopes as part of your feline heartworm prevention campaigns. Agonizing to Treat - Easy to Prevent is an educational booklet written in comic book format that discusses what every dog owner should know about heartworm disease. There is no charge for the booklet but due to the size and weight, there is a shipping and handling charge assessed as indicated below.